WiseGeek.com writer Donn Sayler provides in-depth information on steam traps in the quoted article. He explains how the four types of this device work to maintain the efficiency of different kinds of steam engines. Installed between pipes that transfer steam, these traps are designed to maintain a low level of steam consumption, eliminate condensate, water, and types of gas that do not turn to liquid as they cool down. A steam trap is an instrument utilized to eliminate water and non-condensable gases from steam lines. Steam traps serve three key responsibilities: maintaining a low level of steam consumption, getting rid of water as it forms, and eradicating air and non-condensable gases. Typical steam traps are simply valves that operate automatically, opening, closing, and regulating as necessary to ensure the three functions are performed without incident. 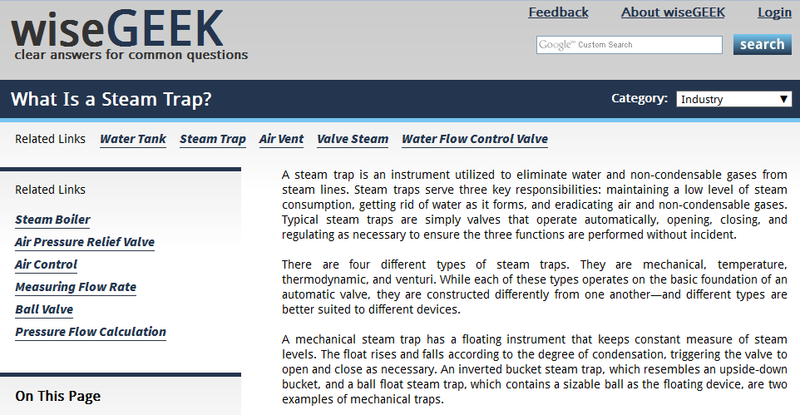 There are four different types of steam traps. They are mechanical, temperature, thermodynamic, and venturi. While each of these types operates on the basic foundation of an automatic valve, they are constructed differently from one another—and different types are better suited to different devices. One of the issues a quality steam trap helps prevent is water hammer within a system. This is the banging and knocking that can be heard from pipes when water flow is suddenly stopped, producing pressure or even a shockwave that travels faster than sound. In most cases, the pressure can cause pipe fittings to burst or explode, potentially causing unfortunate accidents that can lead to major injuries in your workplace. Therefore, steam traps are installed not only to increase efficiency but also to keep safety issues at bay and provide a safe working environment for your employees. Without steam traps, pressure produced by speeding liquid or gas can’t be properly monitored or controlled. While the manual operation of valves may help, automatic control is far more efficient and is less prone to errors that can potential destroy the system. Well known companies like ALB Industrial Supplies, Inc. can provide high-quality steam traps for large or small operations, and these trusted names in the supply industry can assure you that your purchases will genuinely come from the brand manufacturers of your choice.